ROAD TOWN, Tortola, VI - On Monday, September 16, 2013 Digicel British Virgin Islands welcomed yet another member to their growing team, twenty-five-year-old Jasmine Perez, resident of Hope Hill, as their new Assistant Public Relations Executive. Digicel CEO Declan Cassidy has created the new role as he continues to strengthen Digicel ranks with top talent; the objective is to ensure that customer satisfaction remains at an all-time high to help improve the already excellent service that Digicel BVI provides. Miss Perez will be the spokesperson for Digicel BVI and will be charged with keeping the public informed of new promotions and deals available. You can look forward to seeing and hearing her on television and radio as Digicel continues to promote “Free All Ova” and other value packed promotions in the future. “I am very happy to be given such an opportunity and I look forward to being a part of such a forward-thinking company like Digicel,” said Miss Perez. Jasmine Perez is a well-known radio/television personality and a former Miss British Virgin Islands contestant. 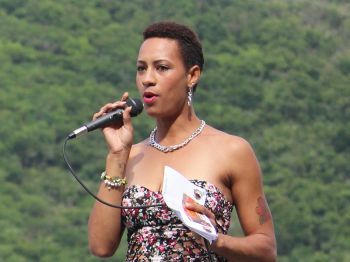 Whilst being no stranger to the media, Miss Perez has also been involved in numerous community-based activities such as the Special Olympics and the Miss Earth British Virgin Islands Pageant. “Digicel has expanded since its launch in 2008 and the best is yet to come. With network upgrades, a growing team and value plans like “Free All Ova”, we endeavor to continue to build on our promise; Be Extraordinary. In addition, Digicel has included an extensive learning and development program as a part of their expansion. This allows staff the opportunity to further their training. Digicel is about providing opportunities and developing young talent,” stated Digicel BVI CEO, Declan Cassidy. I hope them dont pay her less than the expat?